We really enjoy seeing what our customers make with our stamps!! You are all so talented and are doing such a great job bringing our images to live!! Thank you so much for taking time to share your makes with us in our Customer Gallery. We would like to announce the winners from the last few months! We love how Kerry incorporated our stamps into scrapbook layouts for her daughters (you can see other two pages on Kerry's blog). 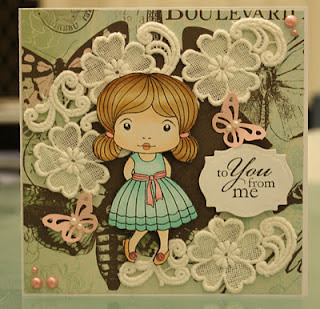 We fell in love with the soft look of Tracey's card! Want to know where the gorgeous flower lace is from? You can find out on Tracey's blog. 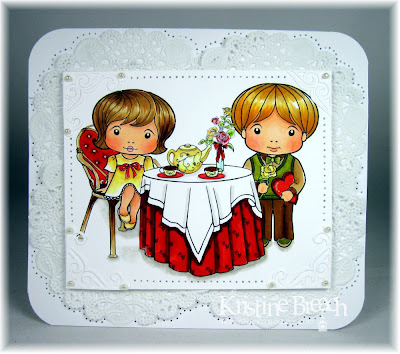 We love how Kris created a scene with two of our stamps - Darling Marci and Amour Luka! What can we say? Gorgeous card Kris, just GORGEOUS!! We just love this bright and happy card with our Ballerina Marci. Congratulations Ladies!! Please email us at info@lalalandcrafts.com with your choice of a rubber stamp from our STORE and your mailing address! !